Who Should Care for Health Care? A person close to me had to spend a couple of weeks nursing an ailing relative in a GH, because it was a police case and private hospitals wouldn’t admit him. Although this was around ten to fifteen years ago, this person still remembers vividly the pathetic conditions he encountered and shudders at the very memory. He recalls how he had to step over patients lying in deplorable conditions through the staircases connecting different levels because they were not given a room. The terror in his eyes is evident as he remembers how the patient next to him had been dead for a couple of hours before the attending nurses realized it, and how the body lay there right next to him and his relative because no one came to claim it. I also remember being hospitalized a couple of times during childhood, both in government run hospitals. The first was in Delhi when I was barely 4, and contracted pneumonia. Though I personally do not remember much about it, I do remember the face of the gentle doctor uncle who treated me. My mother and father seemed quite satisfied with it, for it cost them much less and gave good care to their daughter than the private hospital they took my brother to when he contracted the same disease. I do remember it was not awesome, but it was also not unclean or unhygienic, except perhaps the toilets. I can still recall my mother grumbling when she had to first clean someone else’s crap before letting me use the place. The second was when my brother was again hospitalized for appendicitis operation in Chennai. Though it was not a GH, it was a Public Health Center, and yet the facilities were decent enough. One of my relatives, a very obese person with unhealthy eating habits and smoking addiction, contracted palpitations and chest pain all of a sudden in 2008. The nearest private doctor he went to, took his echo cardiogram and all other sundry tests and declared that angioplasty was required. My relative, who is not very well off financially, was given an estimate of 1.5 lakhs. He decided not to undergo operation, since he could not afford it, and continue working for as much time as was available with him to leave his wife and son with enough money. On our insistence, he agreed to take a second opinion in a Super Specialty hospital in Bangalore, run by the trust of a renowned saint. I accompanied him through the consultation, and there was not one penny that we were asked to spend there. Furthermore, the consulting doctor told him, whether surgery is performed or not, his condition would not improve unless he quit smoking and mended his eating habits. He put my relative on an year of medicines, and asked him to come back next year. My relative has been going for his yearly visits religiously, and is in quite a better shape than he was before. 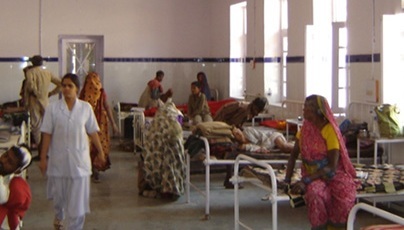 All, without a single paise being spent on the hospital. 1. For the government, already burdened with numerous responsibilities, getting deep into the nitty-gritties of health care might be a cumbersome job. It should probably limit itself to a supervisory and moderating role. 2. Private players can bring in the latest advancements in health care much more easily than the government. However, their high costs render them inaccessible many a time to the needy. 3. Government can give liberal sops to private players who make the best health care accessible to people of all economic strata, equally. This will motivate the private players to lower their rates. Those who charge exorbitantly in spite of receiving the sops must have their license canceled. 4. The government should also encourage private players to take their services to the remote and undeveloped corners of the country, and help them with all the necessary support to do that. It is not a question of who will be the best health care giver – the government or private firms. The question is, how can both work together to take the best health care to the door step of the poorest man in the country. I agree health is our privilege and government should make it a priority. However, the universal health system has been working great so far in many developed countries and I am hoping that once corruption is sealed. India can have a good health care system. Amen to that Ruchira. Corruption is one disease that nullifies anything good anyone attempts to do, government or private. Well said. But, the government in a supervisory role? Yeah, there should be checks and controls, right?